For most of us, a visit to the beach is part of our dream trip. I love the beach but hate the sand! Sometimes I have passed on a trip to the beach just because of the hassle with sand everywhere. There is nothing more annoying than putting your beach towel in your bag and your bag is full of sand. Recently, I found a towel that eliminates the problem! 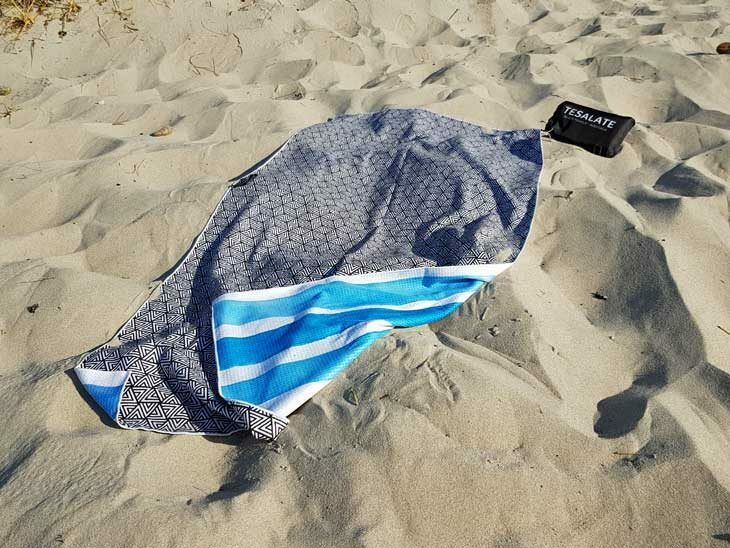 The clever people at Tesalate has made a beach towel made of a microfiber called AbsorbLite™ (80% polyester + 20% polyamide) which lets sand slip off easily. Sounds almost too good to be true, so I decided to test it myself. 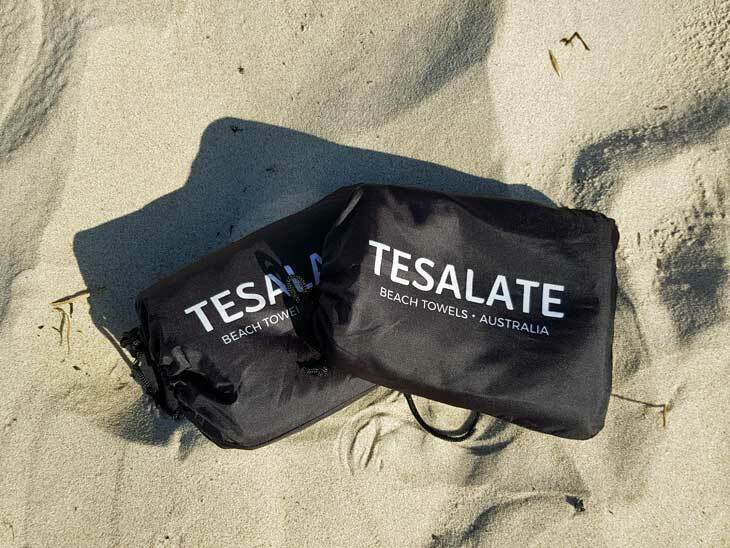 Is the Tesalate Beach Towel sand free? The company boasts that their beach towels are sand free, and they definitely are! If you pour sand on the towel it almost falls of, if the towel is angled. Regular terrycloth is full of minimal loops to create a soft surface to rub against you, where the loops are perfect hideouts for sand. The AbsorbLite™ microfiber has a smooth surface which means that the sand does not stick and falls of easily. The AbsorbLite™ surface is just as smooth as terrycloth. Remember that we have something called gravitation on earth, which means that if you get sand on your towel and you don’t shake it, the sand will stay. The good thing is that the sand disappears almost instantly if you give your towel a light shake. An old-fashioned beach towel of terrycloth attracts huge amounts of sand when wet, compared to a dry towel. The Tesalate Beach towel also attracts more sand when wet, but the good thing is that it dries a lot quicker than a terrycloth-towel. The makers states that it dries twice as fast as a regular towel. I never clocked the drying time of the Tesalate, but it seems right when doing unscientific tests. The Tesalate takes considerably less space in your bag than an old-fashioned towel, which is nice. Your luggage weighs less, which is important because the baggage allowances are shrinking. Many of us travel with hand luggage only, which would easily be half full when you have packed a terrycloth towel. It is delivered in a clever carry bag and has a full-sized hanging hook, so you can hang it anywhere. This is a great product and highly recommended. I love it! Yes, it will cost you a little more than a bad terrycloth towel at the supermarket, but you will receive peace of mind with almost no sand and less weight to lug around. The fact that it comes in several different designs, patterns and colors that allows you to express your personality on the beach, makes it even better! Check out all designs on tesalate.com. What is your experience of sand-free towels? Please share in the comments below, on Twitter, Facebook , Instagram or Google+.